In just under a month from now, one of the most interesting literary festivals I have had the pleasure of attending kicks off in the City of Brotherly Love, Philadelphia, the home of Edgar Allen Poe and David Goodis: NoirCon. This year, NoirCon runs from October 26 to 30. If you already plan on attending, see you there. If not, now is the time to register. It’s runs is not your common or garden-variety festival. No way. And that is a very good thing. The focus is firmly on noir, mainly fiction, but also film, poetry or whatever (and that last category, ‘whatever’, encapsulates some pretty bizarre material). It is great to sit in a room of people who, more or less, are all on the same page about their love of noir. Anyway, NoirCon’s organiser, Lou Boxer, has come up with another terrific program, including some special guest, which you can view in detail here. A warning: the following interview with Eddie Muller does not contain any discussion of the question, ‘what is film noir?’ It’s one of the few film noir related topics I didn’t talk about with him. Muller, sometimes known as ‘the Czar of Noir’, is a busy guy, founder and president of the Film Noir Foundation, fiction and non-fiction author, publisher, film restorer and now DVD distributor. His Dark City: The Lost World of Film Noir (1998) and Dark City Dames: The Wicked Women of Film Noir (2001) are required reading for all would-be scholars film noir, and he has a new book out, Gun Crazy: The Origin of American Outlaw Cinema. Directed by Joseph H Lewis, Gun Crazy is the sordid story of a husband and wife team of criminal sociopaths, played by Peggy Cummins and John Dall. The film sank without a trace upon its release in 1950, but is now regarded as a classic and a much earlier precursor to the 1967 film, Bonnie and Clyde. Literary obscurity is a curious beast. Why do some writers get discovered and stay famous, while others, perhaps just as good, possibly even better, remain undiscovered or burn brightly for a brief period only to become completely unknown? Is it talent, perseverance, astute management, zeitgeist, or just plain luck? And the process by which forgotten writers are rediscovered can be even stranger. The ebb and flow of literary fame is one of the undercurrents running through French-born, Los Angeles–based journalist Philippe Garnier’s biography of David Goodis, Goodis: A Life in Black and White. Published in France 30 years ago, it was only translated and published in English for the first time in 2013. You can read the rest of my review of Philippe Garnier’s Goodis bio, Goodis: A Life in Black and White, here on the Los Angeles Review of Books site. What I love about the canon of cinema known as film noir is just when you think you’ve seen the all important films, along comes something and blows you away. Thus was the case recently when I watched the 1957 film The Burglar, based on the book by one of the doyens of classic noir fiction, David Goodis, who also wrote the screenplay. It begins with a cinema newsreel story titled “Estate sold to spiritualist cult in strange bargain”. The breathless voiceover tells cinemagoers how a millionaire called Bartram Jonesworth has died and left his estate, including a mansion and an emerald necklace, to an aging spiritualist called Sister Sarah. 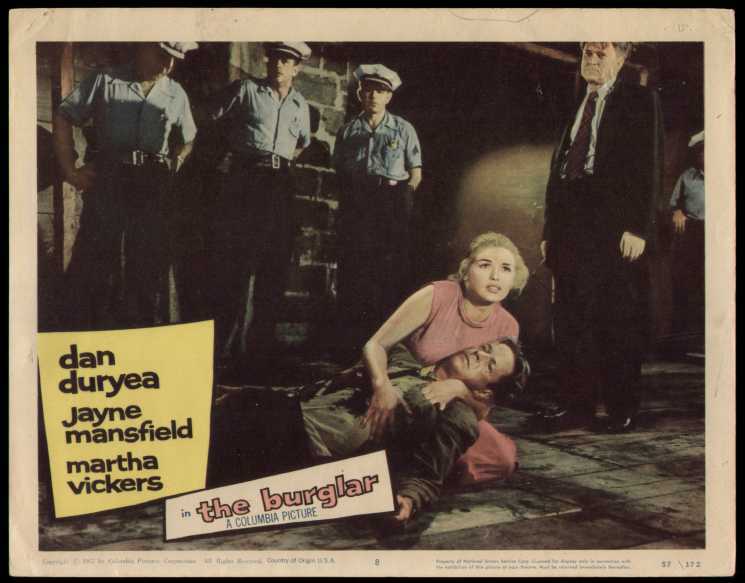 In the cinema audience is career burglar Nat Harbin (long time TV and movie actor, Dan Duryea). So keen is he to get to work on what could be the score of a lifetime, he doesn’t stay for the feature, he bolts outside and starts thinking about how they can steal the necklace.